At first, the opener on The Damned’s 11th album reminds you of something you can’t quite place. It’s on the tip of your brain. Then the penny drops, from a faraway, unlikely place: it’s the early Moody Blues. Standing On The Edge Of Tomorrow – a distinctly Hayward/Lodge phrase – has all the trimmings of the Brummies’ hippie heyday: harmonies, a richly mixed rush to the refrain, and a dash of the-future-isnow sci-fi. Dave Vanian has said that The Damned hired Tony Visconti (for nine intense days in Brooklyn) because they loved Bowie’s Blackstar. What they got was the Visconti who, in Captain Sensible’s words, “specialises in beautifully crafted old-school production”. He first heard the ex-punk durables via Marc Bolan. He did work with the Moodies in the 90s, but that’d be stretching a point: while this is far removed from the experimental Blackstar, neither have The Damned turned into dark knights in black satin. They’ve made a solid, surging album that stirs up elements of rock’s past in a salty brew. What a writhing, wriggling mass of contradictions The Damned have always been, as discombobulating as opening a vat of snakes. From the purity of New Rose to protesting their skilled musicianship, from goth to the high camp of Eloise, from trashing their cred with the Captain’s Happy Talk to winning it back via years of euphoric live shows, they’ve forged a peculiar path. 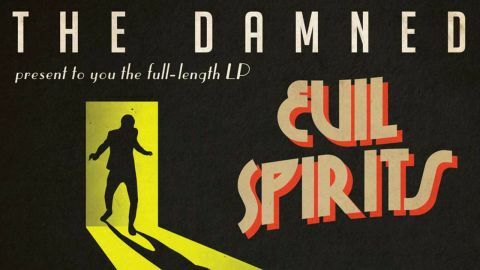 Evil Spirits is a whirl of Shadows twang, steampunk and wailing guitar that embraces the ghosts of the 60s more closely than any punk notions. While hooks like ‘I’m a devil, a complicated rebel’ evoke images of Alan Partridge playing Nigel Farage in a motel bedroom mirror rather than Bela Lugosi, there’s also a thread of seriousness. They lambast the way ‘our masters’ have got us fighting each other, and the subject of The Daily Liar is obvious. The Damned, in their lyrics, sound more frightened than frightening: a just response to contemporary calamities. Those 60s nods abide: the title track echoes Love Potion No. 9 and indulges some Zombies-like keyboards. Vanian’s clenched vocals refract Alice Cooper, though of course Sensible chimes in with chinks of cheeriness. Paul Gray returns on bass. Visconti busies it up, eking out build-ups and layering the ambient sound of a crowd arguing on We’re So Nice, while closer I Don’t Care gets jazzy. Overall, though, this is a well-behaved, orderly Damned: stoic, steady-handed and spirited.